William Hogarth (1697–1764), The Idle 'Prentice Turned Away and Sent to Sea (advanced drawing) (Industry and Idleness 5) (1747), Indian ink on paper, 21.6 x 29.2 cm, British Museum. Scanned from Ayrton & Denvir (1948). When I covered Hogarth’s narrative series here and here, I mentioned two which were not painted, but which went straight to prints. Since then I have been able to obtain images of the original drawings which he did for those two series, and thought that it would be worth looking at those in more detail, both from the point of view of their narrative, and to see inside his print making process. This article covers the first half of the longer and earlier series, Industry and Idleness (1847). The next concludes that series, and the final one covers The Four Stages of Cruelty (1751), his penultimate narrative series. 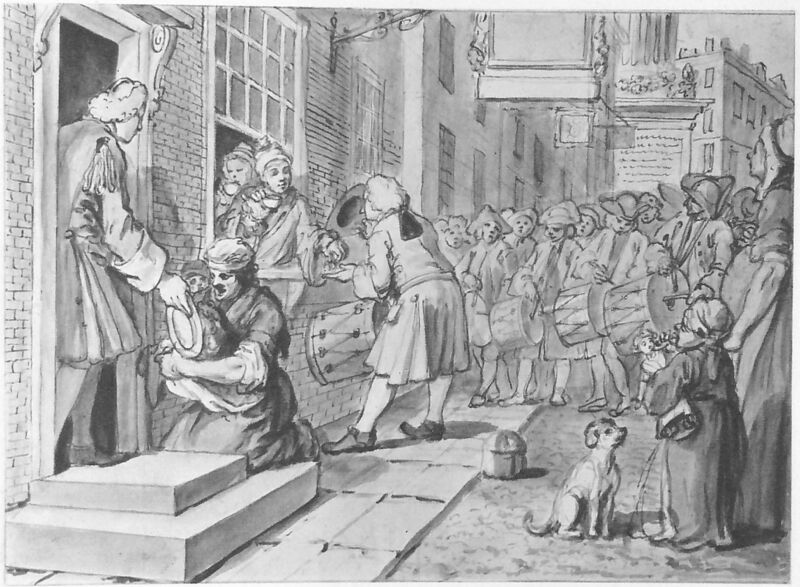 For all his previous series, Hogarth had made paintings from which engravings were then made. 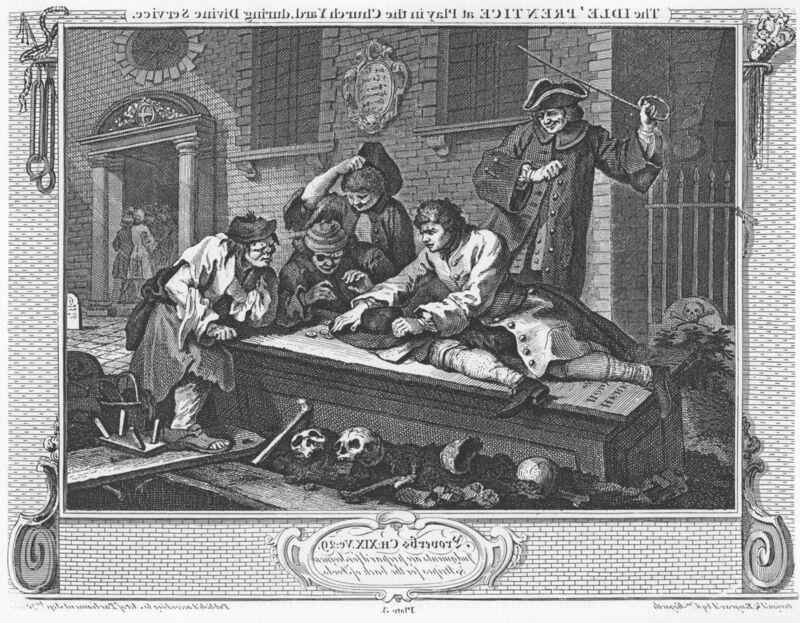 Although it is sometimes stated that this series was created “solely” as engravings, the engravings were of course made from Hogarth’s drawings, and most of the latter remain, in the British Museum. Its set was owned by Horace Walpole (1717-1797), son of the first Prime Minister Sir Robert Walpole. They were acquired by the Museum in 1896. It has been suggested that Hogarth was inspired for the series by the play Eastward Hoe! by Marston, Chapman and Jonson, which was reprinted prior to his starting the drawings in 1747. The prints sold very well indeed, and spawned a pantomime, another play, and abundant literary comment at the time. 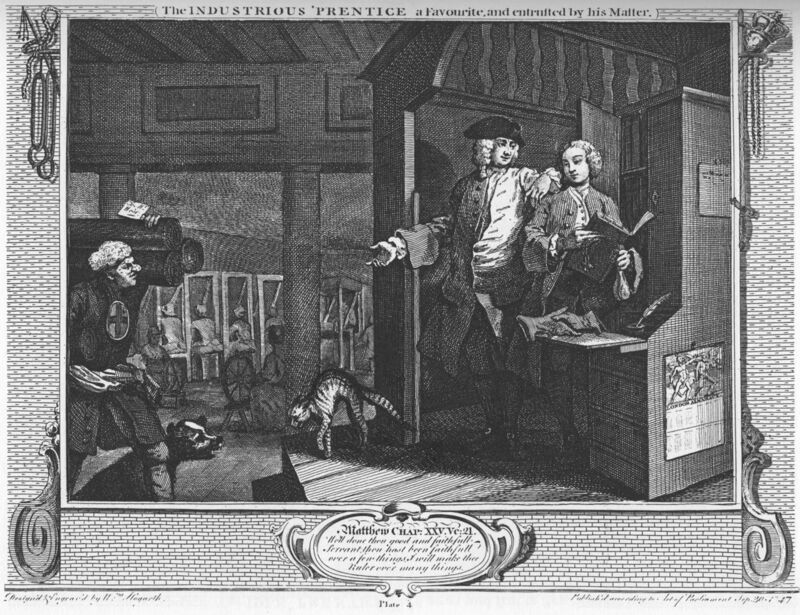 Two apprentices (‘prentices in Hogarth’s usage), named Francis Goodchild (the industrious ‘prentice) and Thomas Idle (the idle ‘prentice), start on equal terms, apprenticed to their Master, a Mr West. They behave true to form, with Goodchild diligently working and attending church, and Idle being idle whenever he could, gambling and cheating out in the churchyard rather than going to church. Goodchild is rewarded by promotion at work, gaining more of his Master’s trust; Idle, though, ends up going to sea and abandoning his apprenticeship. Goodchild then marries his Master’s daughter, in contrast with Idle, who returns from sea to lodge in a garret with a common prostitute. Goodchild just continues to rise, growing rich from the family business, and becomes Sheriff of London. Idle, though, has progressed from highway robbery to murder, but is betrayed by his prostitute partner. The former apprentices meet again, when Idle is brought before Goodchild following his arrest, for committal to prison while awaiting trial. Idle is found guilty and hanged at Tyburn. Goodchild is made Lord Mayor of London in return for his hard-working and virtuous life. 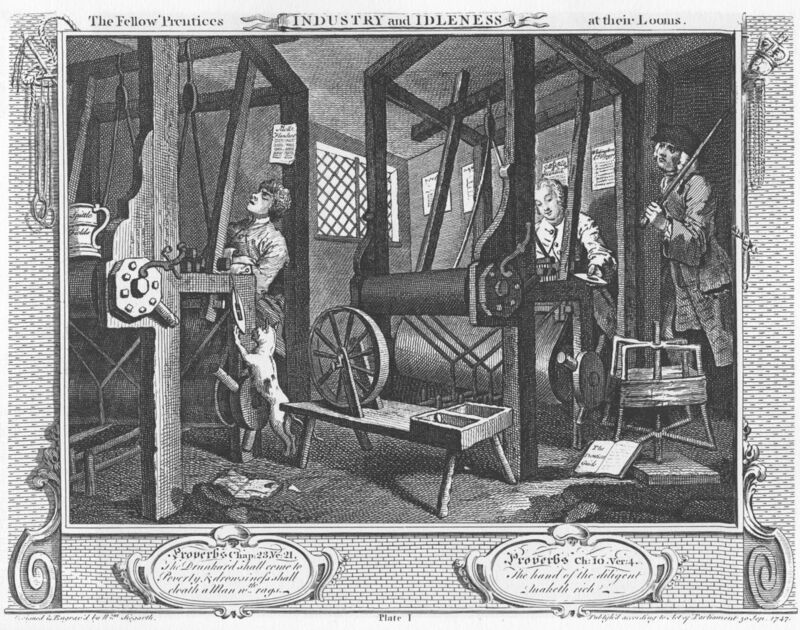 William Hogarth (1697–1764), The Fellow ‘Prentices at their Looms (finished print) (Industry and Idleness 1) (1747), engraving, 25.7 x 34 cm. Wikimedia Commons. 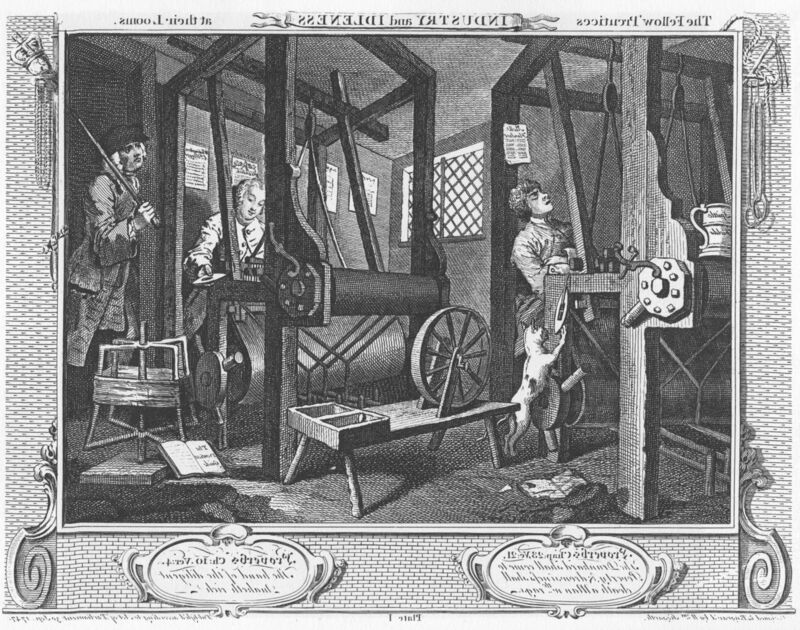 In the first print, Hogarth shows the two apprentices together at their work, their Master at the far right. 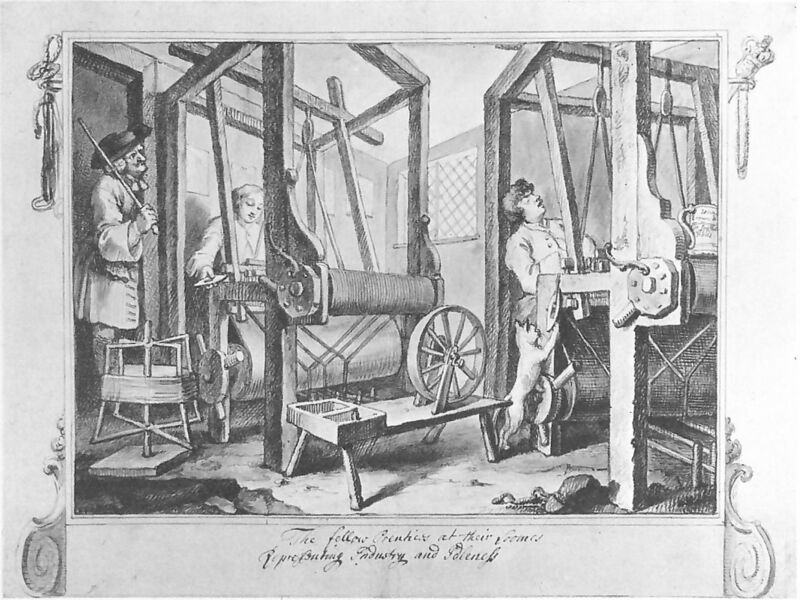 Goodchild, to the right of centre, is labouring away at a hand loom, which has not yet incorporated the fly shuttle invented by Kay in 1733. By his feet is an open book, with the title The Prentice’s Guide. Idle is at the left, his eyes closed in sleep. His loom is locked off, and his clay pipe wedged into the loom handle. A cat plays with the idle shuttle, and a beer mug is balanced on its frame. His copy of The Prentice’s Guide is torn and tattered, and above his head is a ballad sheet titled Moll Flanders. Symbolic items decorate the frame: a mace of high office (for Goodchild), and the hangman’s noose (Idle). 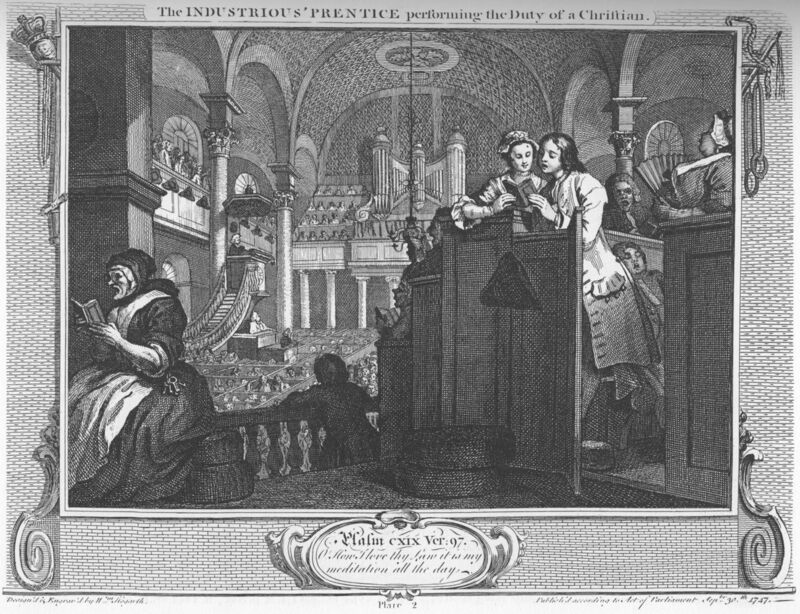 William Hogarth (1697–1764), The Industrious ‘Prentice Performing the Duty of a Christian (finished print) (Industry and Idleness 2) (1747), engraving, 25.7 x 34 cm. Wikimedia Commons. 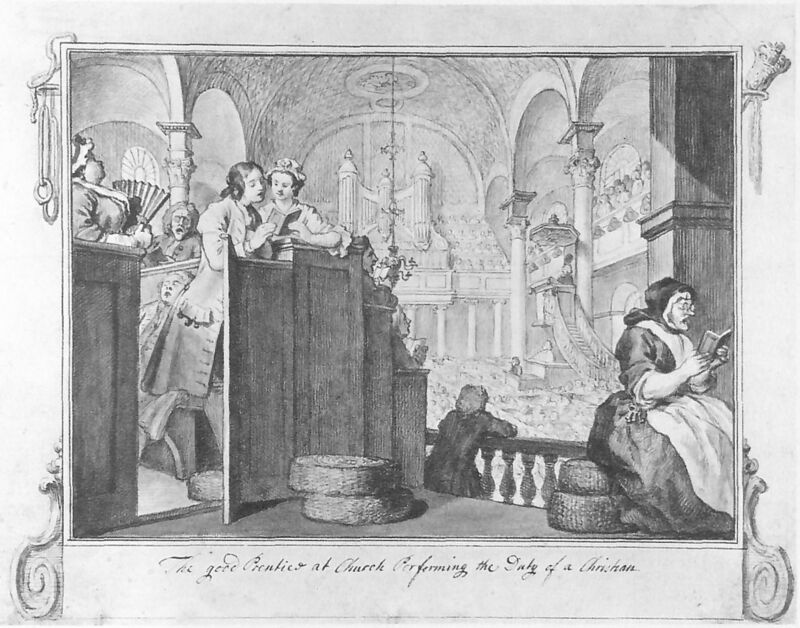 The prints now trace their separate ways, first with Goodchild’s pious and upright lifestyle, in church (probably St Martin’s-in-the-Fields) on a Sunday. He stands in a pew, sharing a hymnal with the Master’s daughter. By Goodchild is a large and buxom woman, possibly the Master’s wife, keeping a close eye on the couple. At the left is a caretaker and pew-opener with her bunch of church keys. The preacher is in the distant pulpit, under which are a clerk and a reader. 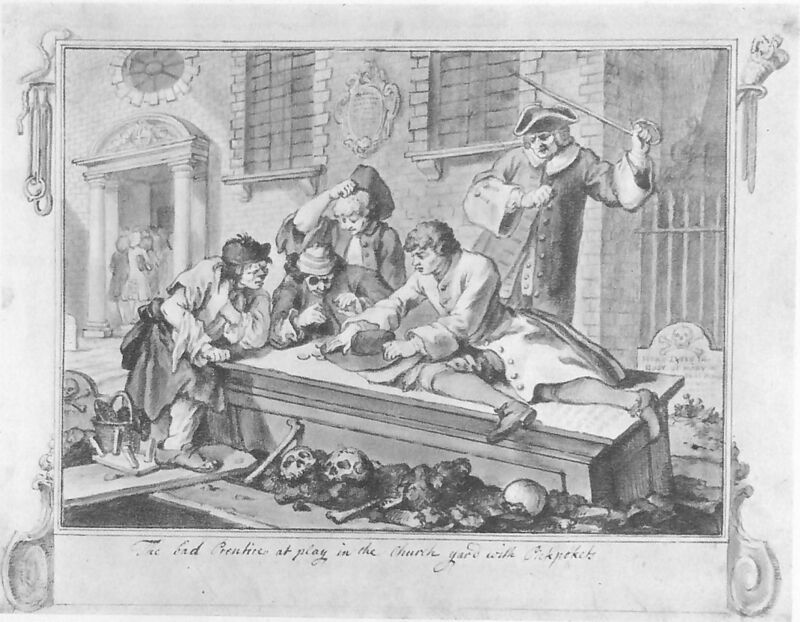 William Hogarth (1697–1764), The Idle ‘Prentice at Play in the Church Yard during Divine Service (finished print) (Industry and Idleness 3) (1747), engraving, 25.7 x 34 cm. Wikimedia Commons. While Goodchild is inside attending the service, Idle is seen gambling on a tombstone, in the company of three other aspiring minor villains. The church shown here is probably St Michael’s in Crooked Lane, or St Paul’s in Shadwell. In the foreground is an open grave which is planked over, with skulls and other remains behind. At the rear left is an irate churchwarden, with his cane raised, who has come to break up the group and move them on. 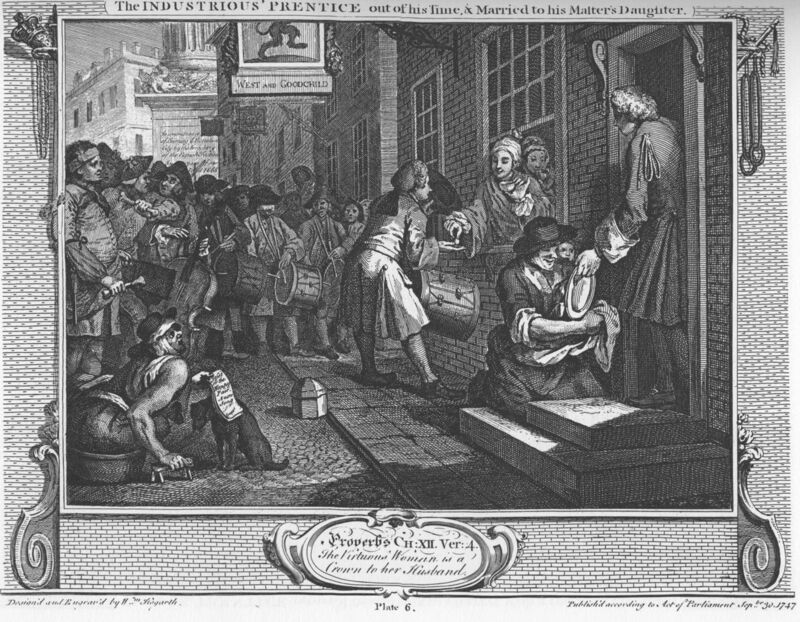 William Hogarth (1697–1764), The Industrious ‘Prentice a Favourite, and Entrusted by his Master (finished print) (Industry and Idleness 4) (1747), engraving, 25.1 x 34 cm. Wikimedia Commons. 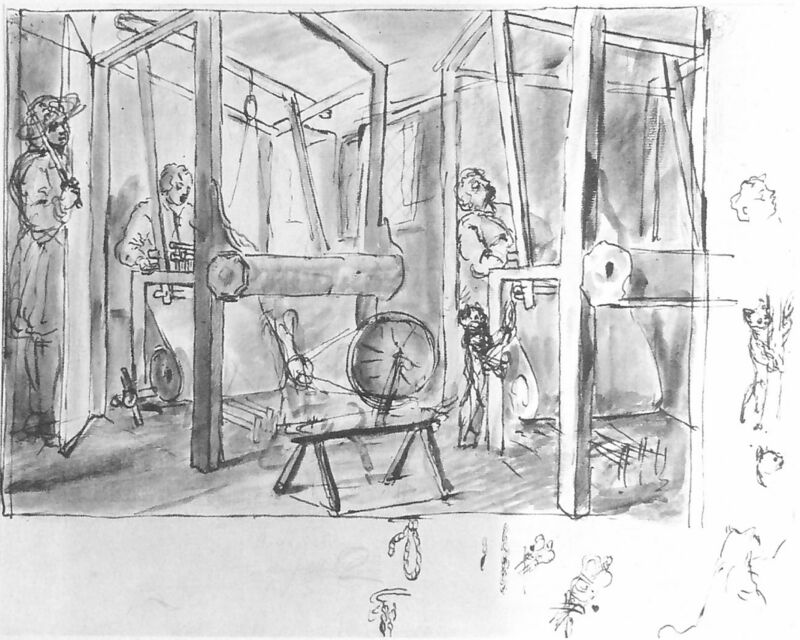 Back at work, Goodchild has been promoted from the loom, and now assists the Master in book-keeping and overseeing the factory, shown by the backs of women spinning and weaving in the background. Mr West, the Master, is shown in Quaker dress. He and Goodchild are stood in front of the escritoire which contains the factory ledgers. The pair of gloves in front of them are locked in a handshake symbolising the growing bond between the two men. At the left is a porter from the City of London (whose arms he bears on a shield on his chest), carrying three rolls of cloth. Between the porter and the others a cat arches its back in response to a dog. Attached to the lower side of the escritoire is the London Almanack calendar. 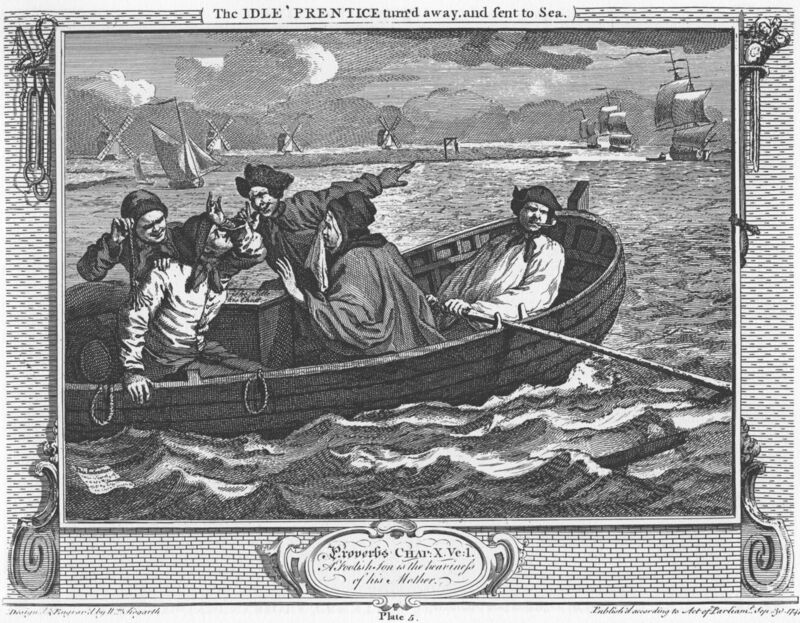 William Hogarth (1697–1764), The Idle ‘Prentice Turn’d Away and Sent to Sea (finished print) (Industry and Idleness 5) (1747), engraving, 25.4 x 34 cm. Wikimedia Commons. Idle has abandoned his apprenticeship, tossing his indenture papers into the waves at the far left, and goes to sea. 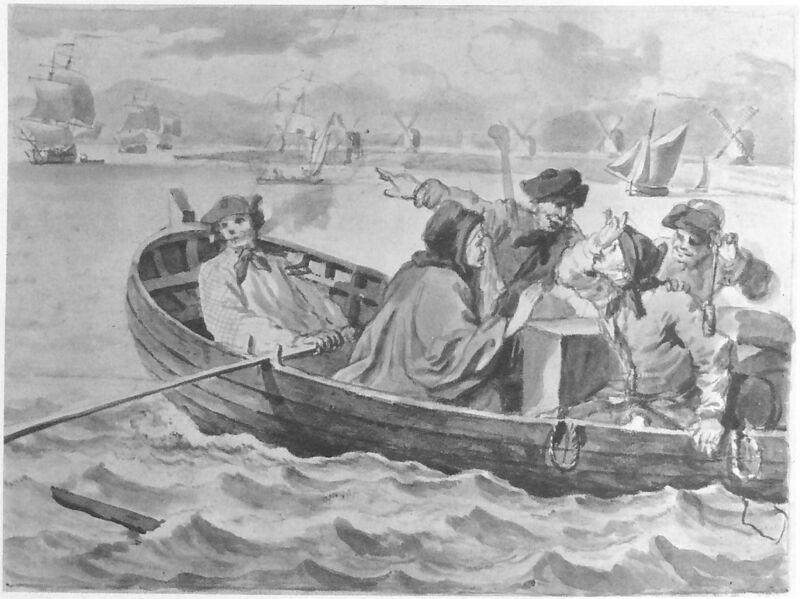 Hogarth shows him being rowed out to join his ship at Cuckold’s Point on the River Thames, opposite what were then the West Indian docks, between Limehouse and Greenwich. With Idle in the boat is his mother, who appears to be protesting his departure. His colleagues in the boat are sailors, who are teasing him with a cat o’ nine tails whip, and pointing out a body hanging on distant gallows, as a portent of Idle’s future. On the shore in the distance, there are also four windmills, which were common in the area at that time. William Hogarth (1697–1764), The Industrious ‘Prentice out of his Time, & Married to his Master’s Daughter (finished print) (Industry and Idleness 6) (1747), engraving, 25.4 x 33.7 cm. Wikimedia Commons. Meanwhile Goodchild has successfully completed his apprenticeship, making him a journeyman weaver, and has joined his Master in partnership, their business sign hanging at the top of the print. The previous day, the Master’s daughter married Goodchild, and they are seen here handing out the remains of their wedding banquet to the poor. Goodchild himself is handing out money through the open window, to the leader of a drum band, his wife being behind him inside. A footman at the door drops food from a plate into the apron of a poor woman, and at the left a legless ex-soldier in a tub holds out a songsheet headed “Jesse or the Happy Pair. A New Song”. The London Monument is seen in the background. I have been able to find preparatory drawings for all the prints in the series, apart from the twelfth and last. In most cases, there is an early rough sketch and a late or even final drawing from which the plate was made. In the series below, I add a final version which is the print mirrored, as if it were the plate. I provide those because the prints shown above are mirrored from the drawings, an artefact of the printing process; showing a mirrored print makes it easier to compare the drawings with the final printed version. As would be expected, the sequence for each print adds increasing amounts of detail. 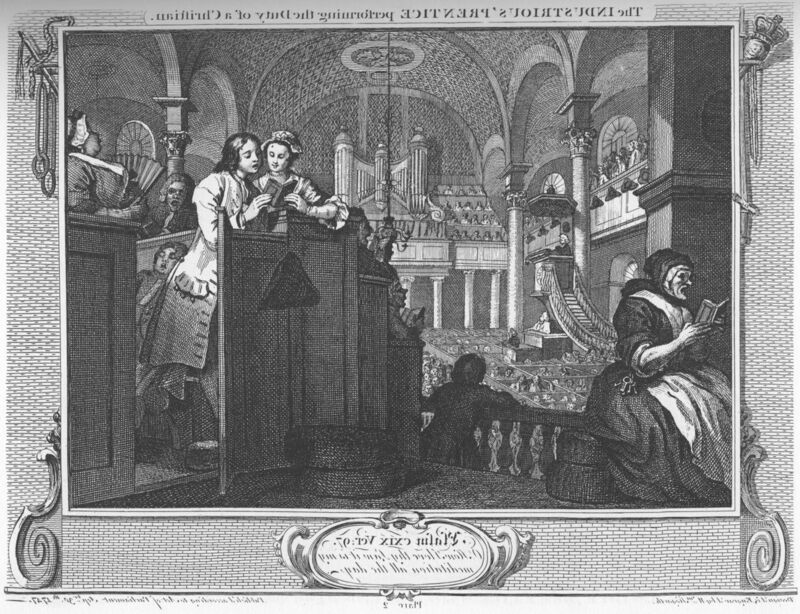 Differences shown between the ‘finished’ drawing and the print indicate that Hogarth made the engravings himself, or was intimately involved in their engraving. He did not, though, select the Biblical quotations which were added: he trusted those to a friend, the Reverend Arnold King. William Hogarth (1697–1764), The Fellow ‘Prentices at their Looms (sketch) (Industry and Idleness 1) (1747), pen and ink with Indian ink wash on paper, 21.6 x 29.2 cm, British Museum. Scanned from Ayrton & Denvir (1948). William Hogarth (1697–1764), The Fellow ‘Prentices at their Looms (finished drawing) (Industry and Idleness 1) (1747), Indian ink on paper, 27.2 x 35.6 cm, British Museum. Scanned from Ayrton & Denvir (1948). William Hogarth (1697–1764), The Fellow ‘Prentices at their Looms (finished print, mirrored) (Industry and Idleness 1) (1747), engraving, 25.7 x 34 cm. Wikimedia Commons. 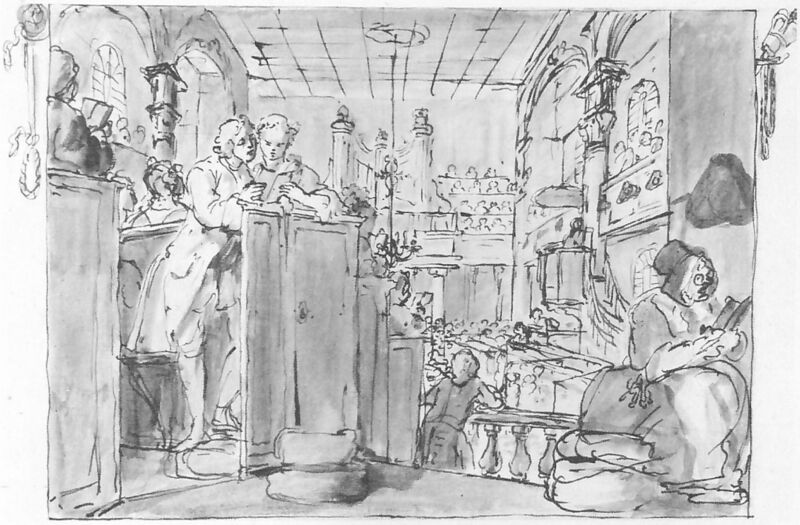 William Hogarth (1697–1764), The Industrious ‘Prentice Performing the Duty of a Christian (sketch) (Industry and Idleness 2) (1747), pen and ink with Indian ink wash on paper, 21.6 x 28.6 cm, British Museum. Scanned from Ayrton & Denvir (1948). 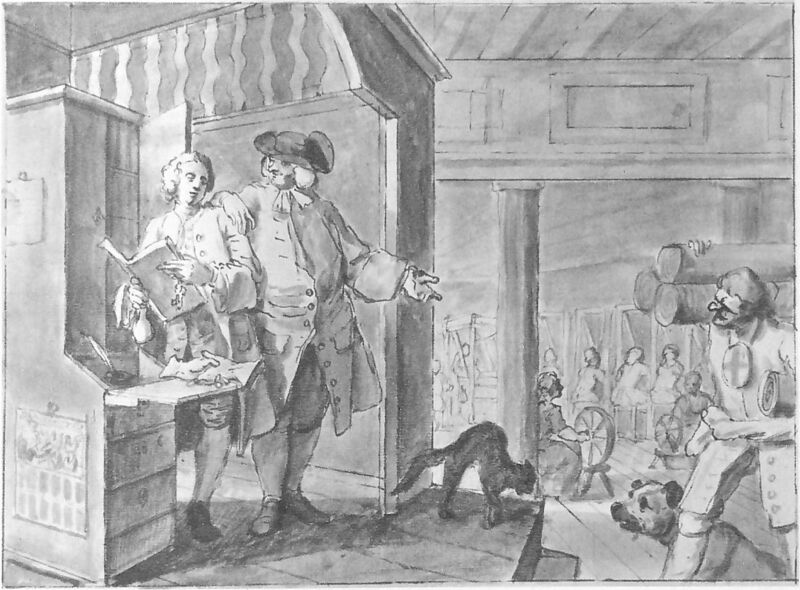 William Hogarth (1697–1764), The Industrious ‘Prentice Performing the Duty of a Christian (finished drawing) (Industry and Idleness 2) (1747), Indian ink on paper, 27.3 x 34.9 cm, British Museum. Scanned from Ayrton & Denvir (1948). 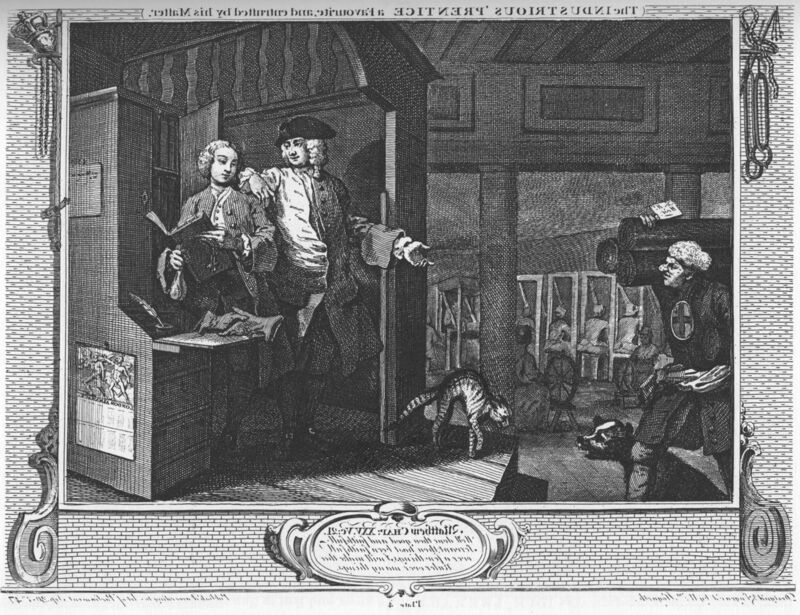 William Hogarth (1697–1764), The Industrious ‘Prentice Performing the Duty of a Christian (finished print, mirrored) (Industry and Idleness 2) (1747), engraving, 25.7 x 34 cm. Wikimedia Commons. 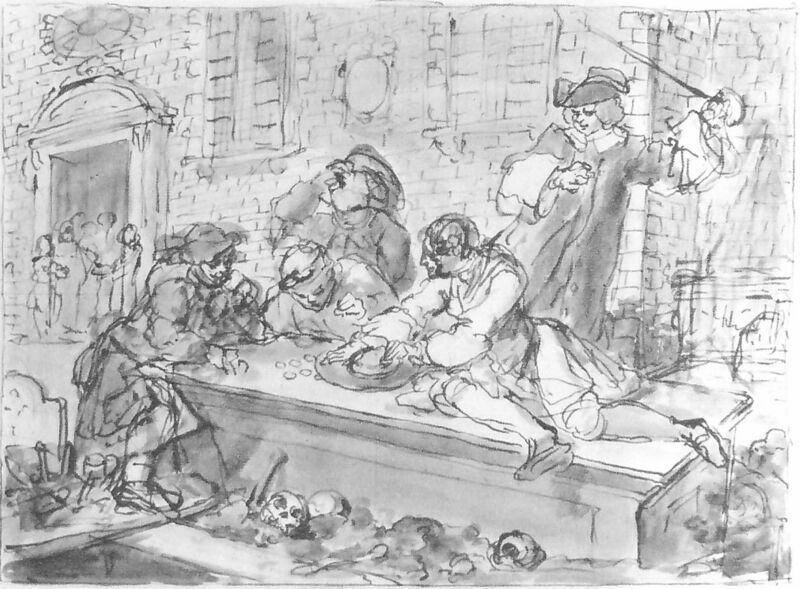 William Hogarth (1697–1764), The Idle ‘Prentice at Play in the Churchyard (sketch) (Industry and Idleness 3) (1747), pen and ink with Indian ink wash on paper, 21.6 x 29.5 cm, British Museum. Scanned from Ayrton & Denvir (1948). William Hogarth (1697–1764), The Idle ‘Prentice at Play in the Churchyard (finished drawing) (Industry and Idleness 3) (1747), Indian ink on paper, 27.2 x 35.1 cm, British Museum. Scanned from Ayrton & Denvir (1948). 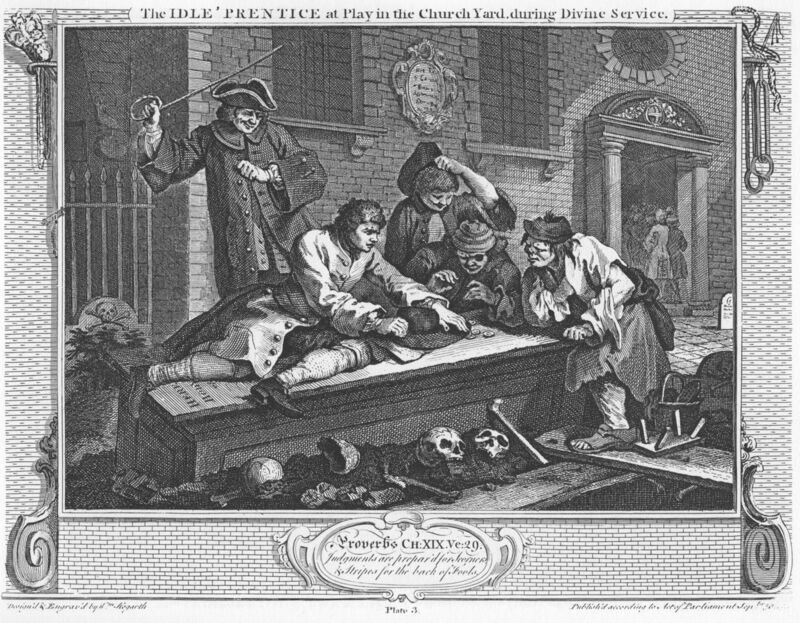 William Hogarth (1697–1764), The Idle ‘Prentice at Play in the Church Yard during Divine Service (finished print, mirrored) (Industry and Idleness 3) (1747), engraving, 25.7 x 34 cm. Wikimedia Commons. 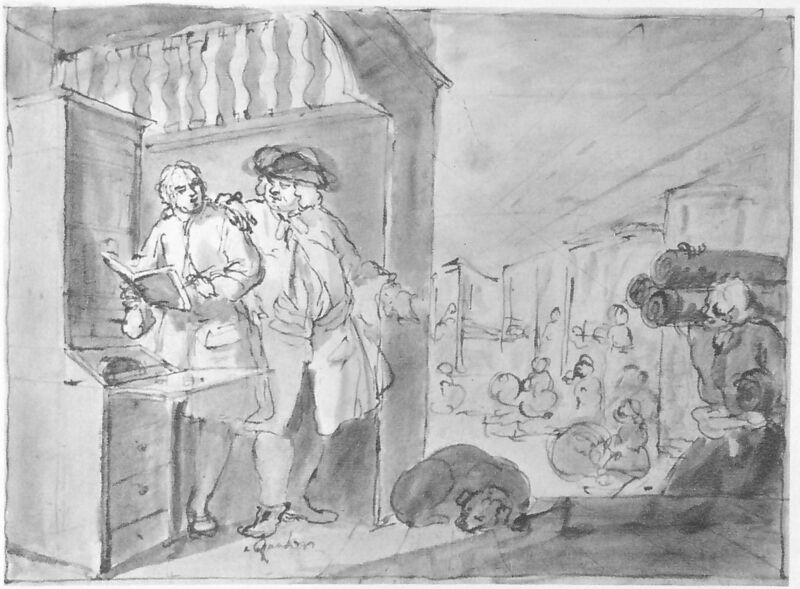 William Hogarth (1697–1764), The Industrious ‘Prentice a Favourite Entrusted by his Master (sketch) (Industry and Idleness 4) (1747), pen and ink with Indian ink wash on paper, 21.6 x 29.2 cm, British Museum. Scanned from Ayrton & Denvir (1948). William Hogarth (1697–1764), The Industrious ‘Prentice a Favourite Entrusted by his Master (advanced drawing) (Industry and Idleness 4) (1747), pen and ink with Indian ink wash on paper, 21.6 x 29.2 cm, British Museum. Scanned from Ayrton & Denvir (1948). 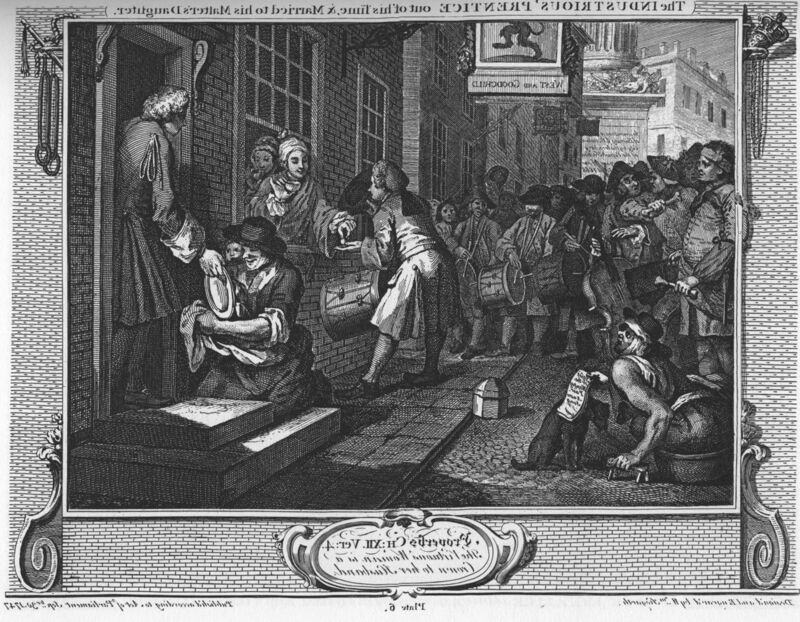 William Hogarth (1697–1764), The Industrious ‘Prentice a Favourite, and Entrusted by his Master (finished print, mirrored) (Industry and Idleness 4) (1747), engraving, 25.1 x 34 cm. Wikimedia Commons. William Hogarth (1697–1764), The Idle ‘Prentice Turned Away and Sent to Sea (advanced drawing) (Industry and Idleness 5) (1747), Indian ink on paper, 21.6 x 29.2 cm, British Museum. Scanned from Ayrton & Denvir (1948). 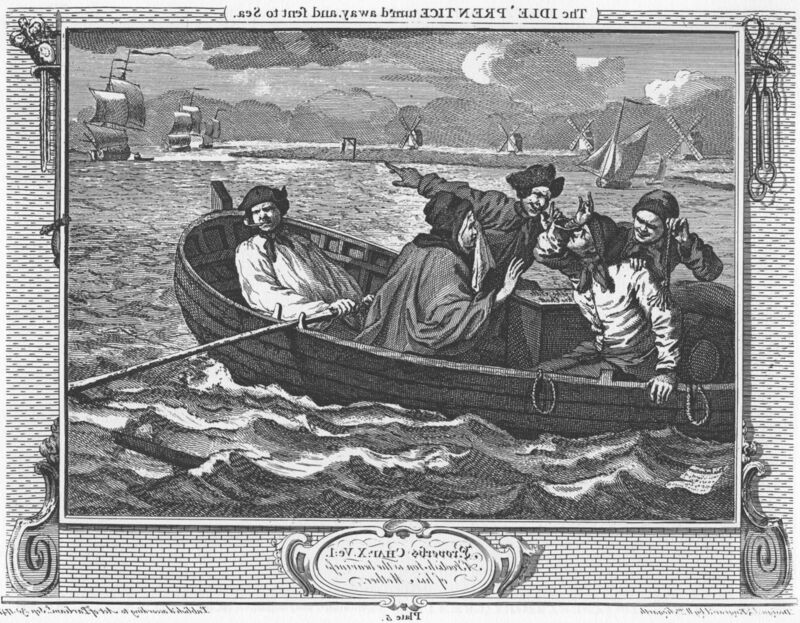 William Hogarth (1697–1764), The Idle ‘Prentice Turn’d Away and Sent to Sea (finished print, mirrored) (Industry and Idleness 5) (1747), engraving, 25.4 x 34 cm. Wikimedia Commons. William Hogarth (1697–1764), The Industrious ‘Prentice out of his Time and Married to his Master’s Daughter (sketch) (Industry and Idleness 6) (1747), pen and ink with Indian ink wash on paper, 21.6 x 29.2 cm, British Museum. Scanned from Ayrton & Denvir (1948). William Hogarth (1697–1764), The Industrious ‘Prentice out of his Time, & Married to his Master’s Daughter (finished print, mirrored) (Industry and Idleness 6) (1747), engraving, 25.4 x 33.7 cm. Wikimedia Commons.